Recently, Pete and I have been making a room in our house into a laundry room, which I will be writing a post about in the coming weeks (when it’s finished.) While looking for fun and inexpensive ways to add little personal touches, we finally broke down and decided to buy some chalkboard paint. It was the perfect opportunity to see if the paint worked like everyone says it does. GOOD NEWS! It does. 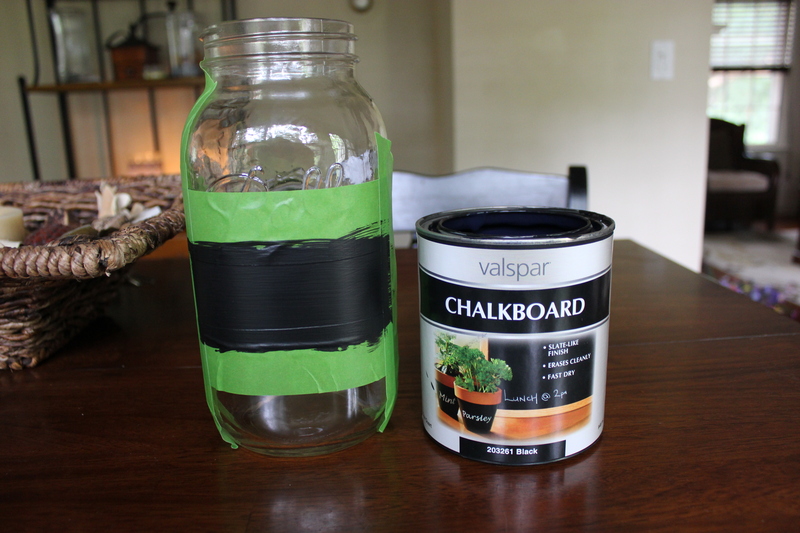 We decided on using Valspar chalkboard paint, we chose that because it was the first and only one we saw at Home Depot. One quart was about $15.00, and I think it was the best $15.00 ever spent. Reason #1- a little bit goes a long way! 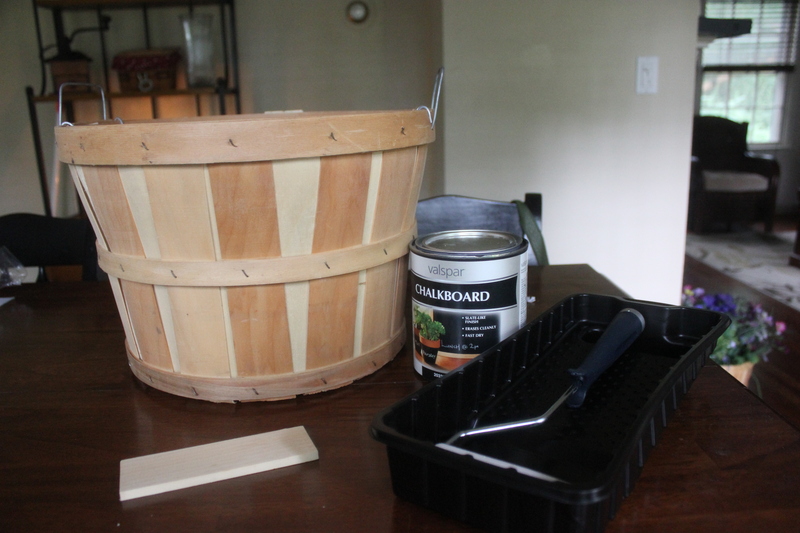 So far I have done 3 different projects with it and I have used a little less than a half a can, and that is great since each project takes 2-3 coats to get a nice even finish. Reason #2- it’s FUN! It’s fun to paint with and it’s fun to play with afterwards. Lastly, reason #3- the creative possibilities are really endless. It’s a win, win, win situation, folks. 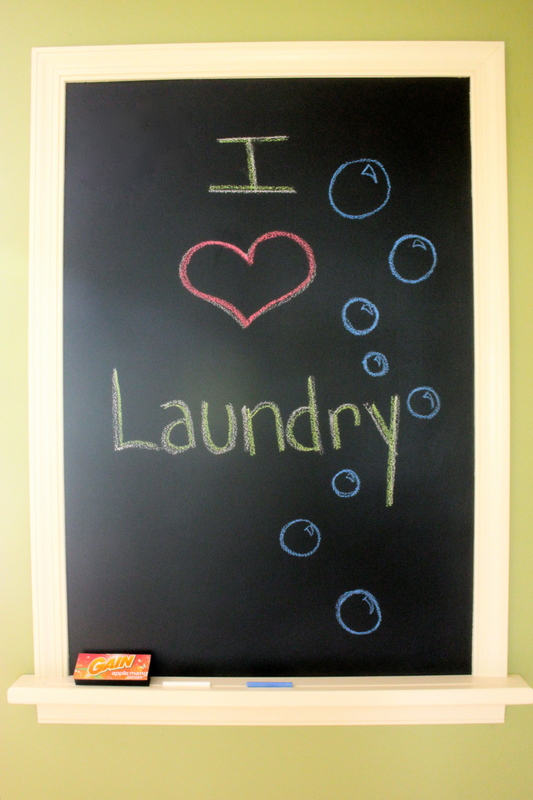 Keep in mind all of my projects are laundry themed, maybe when I start a different room in the house I will have some fresh non-laundry themed ideas! 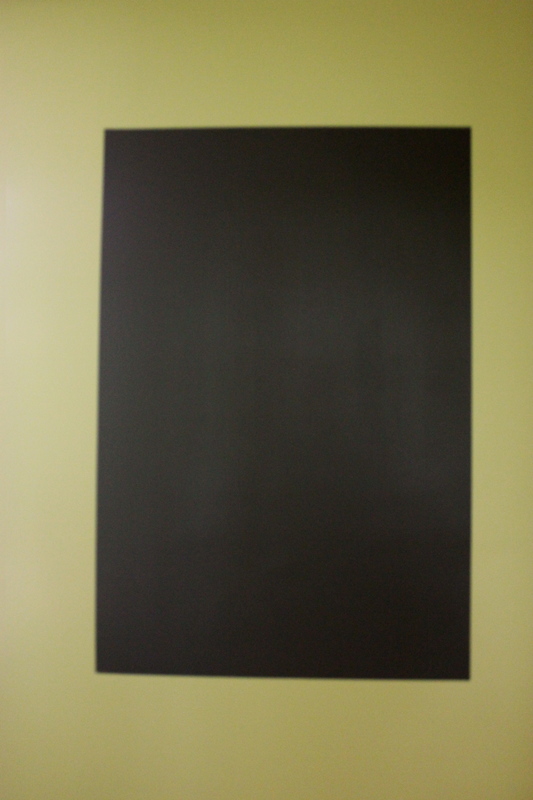 The first project I did with the paint was making a huge chalkboard for the wall. I realize now I maybe should have started on one of the smaller projects to make sure it worked…but apparently I had a lot of trust in this stuff. This idea came from the fact that at work, we sold a chalkboard the same size as the one I made for $229. I knew I could make it for way less, in the end it cost me probably about $20-$25. The way I wanted to do it was to tape out a section on the wall and paint directly on the wall. I did this because this is the only wall in the room it could go on. If you want the ability to move the chalkboard around if you want, you can paint it on a piece of wood and hang it on the wall. Once you let the paint dry for about an hour, you can pull the paint tape down. I personally didn’t care for just the paint on the wall, I wanted a more finished look so we decided to put moulding around it and a ledge to hold some chalk and an eraser. Just a little FYI: The paint recommends waiting 24 hours before writing on it. It was the longest 24 hours of my life. Also, another quick side project: I didn’t like the look of the eraser we bought- it was just a boring blue. So I took an old fabric softener box and slapped some double sided tape on the back and voila! A cute theme-appropriate eraser! 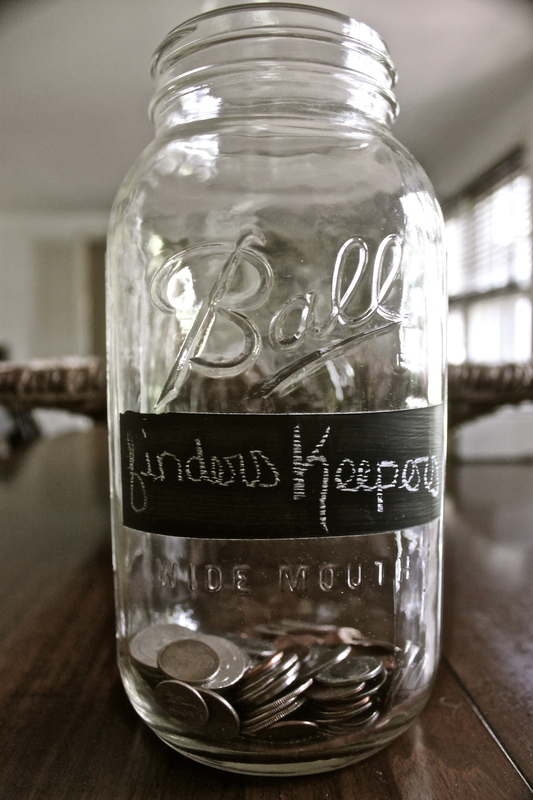 The next project I decided to do was to make a “finders keepers” jar. 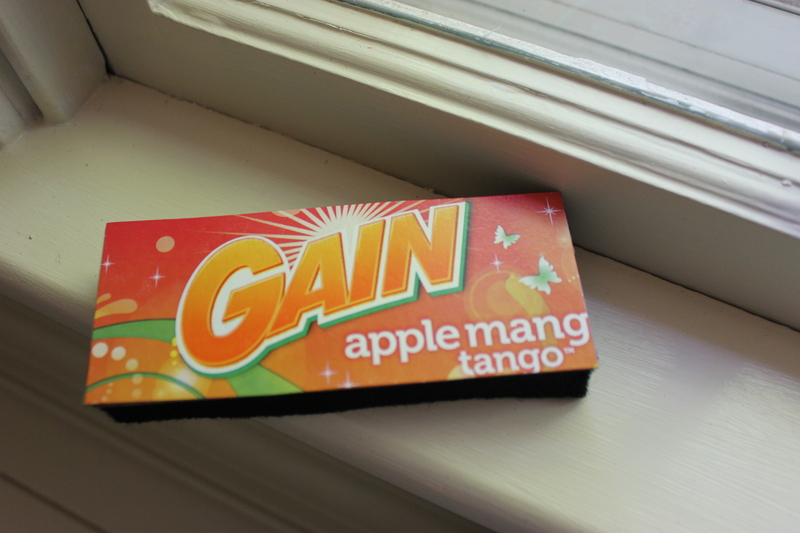 This is going to be for all the change I find in the washing machine. Who said it doesn’t pay to do laundry? For this project I used a huge mason jar (of course.) Any jar would do though, as long as there is a smooth surface that you would be able to write on afterwards. Time to start makin’ money! 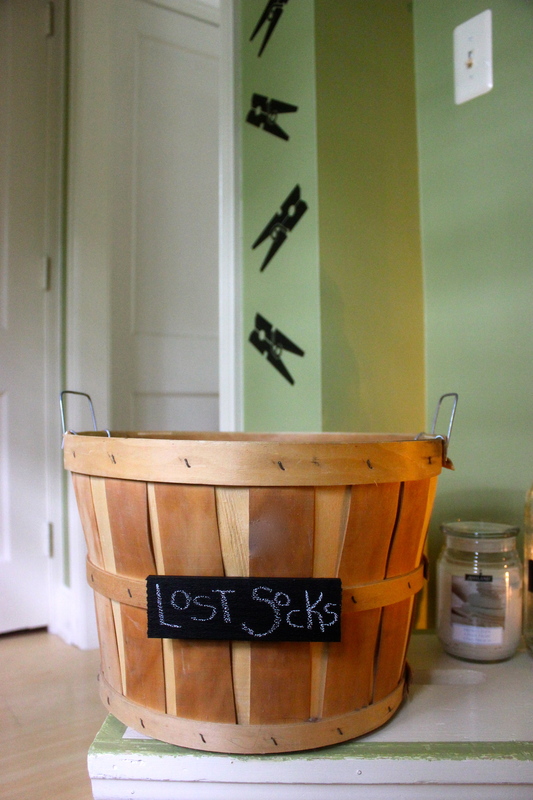 Lastly, the 3rd project I decided to make was a garbage can and a “lost socks” basket. At work I got these peck baskets for $1.00 each and I use them for all kinds of stuff around the house (like easter baskets, towel holders, and flower holders in the fireplace…they are awesome.) 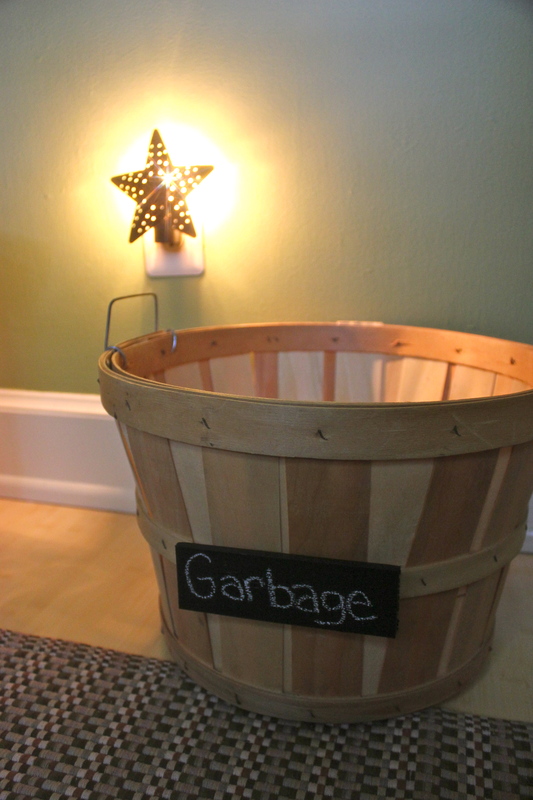 You can use any kind of basket for this project. The only thing that has to be done for this is just paint the wood plaques and glue them on. It took a few hours for the glue to dry so make sure you store them in a safe place while they are drying so nothing bumps them. Well, I hope this inspires you to do some of your own chalkboard paint crafts, we look forward to hearing about any ideas you have! Posted in Home Sweet HomeTagged chalkboard paint, crafts, DIY, laundry, mason jarsBookmark the permalink. I love chalkboard paint. We used it for all the signs etc. at our wedding. Just picked up a bunch of frames at the dollar store and added in a few thrift store finds. Sprayed 2 or 3 coats of chalkboard paint on the glass and $1 never looked classier. I’m still reusing them for parties and events!